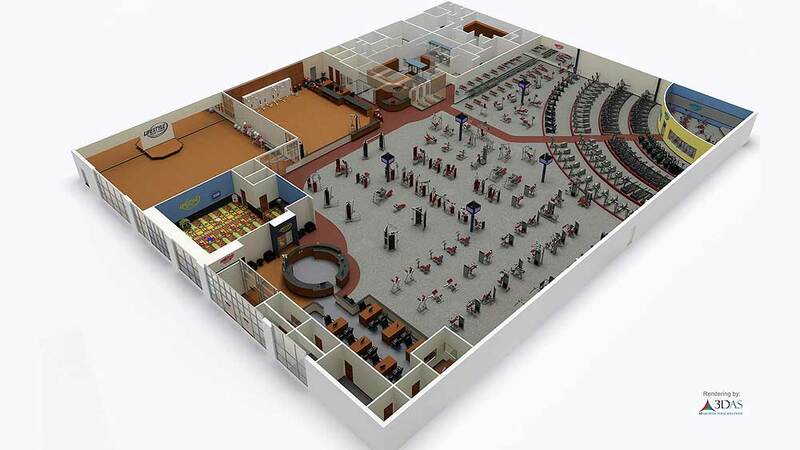 3DAS rendered this 3D gym floor plan and animation in for their Sarasota, Florida gym. Lifestyle Family Fitness was our client and they opened the doors to their first health club in Lakeland, FL in 1982, with a single focus in mind: Provide a fun and friendly experience for each and every member. Lifestyle Family Fitness opened the doors to its first health club in Lakeland, FL in 1982, with a single focus in mind: Provide a fun and friendly experience for each and every member. By 1999, the company had grown to seven health clubs throughout west Central Florida. And it didn’t stop there. As the word spread, increasing demand meant growth was on the horizon. In 2001, Lifestyle Family Fitness founder, Australian-born Geoffrey Dyer, accelerated the company’s expansion through an alliance with Quantum Capital Partners Inc, Ballast Point Ventures – an affiliate of Raymond James Financial and The Burton Partnership. And, in a move to better service the health club customer, the company pioneered the “No Long-Term Contract” policy. This means members enroll on a month-by-month basis only – with no long-term contract ever at any of our LFF health clubs. In addition, new members receive three free introductory personal training sessions, plus a locker-full of health club services and benefits. Lifestyle Family Fitness health clubs feature amenities such as state-of-the-art cardiovascular and strength-training equipment, a variety of group fitness classes for levels ranging from beginners, returning workout enthusiasts, to seasoned fitness veterans, indoor cycling studios, personal training with top-of –their-game-professionals, clean, sanitary locker rooms, tanning booths and a worry-free Kids’ Club staffed with trained LFF personnel. Today Lifestyle Family Fitness owns and operates health clubs throughout the Southeast, Midwest, and Mid-Atlantic with aggressive growth planned throughout the next five years. According to the International Health, Racquet and Sportsclub Association (IHRSA) Lifestyle Family Fitness is one of the top 20 fastest growing health club companies in the world. It is your exclusive health club. The mission at Lifestyle Family Fitness: To fulfill our members’ needs and build lasting relationships through a fun and friendly experience. It is our goal to ensure this is accomplished with every member every day.